Reading and share top 6 famous quotes and sayings about The Way God Works by famous authors and people. 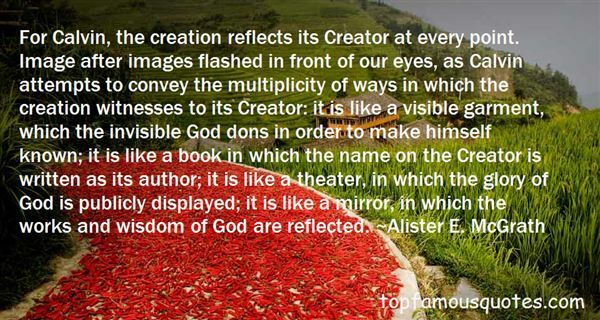 Browse top 6 famous quotes and sayings about The Way God Works by most favorite authors. 1. "For Calvin, the creation reflects its Creator at every point. Image after images flashed in front of our eyes, as Calvin attempts to convey the multiplicity of ways in which the creation witnesses to its Creator: it is like a visible garment, which the invisible God dons in order to make himself known; it is like a book in which the name on the Creator is written as its author; it is like a theater, in which the glory of God is publicly displayed; it is like a mirror, in which the works and wisdom of God are reflected." 2. "They always threw their arms around and hugged me while crying our Yiddish endearments. Yet none of them believed in God. They believed in social justice, good works, Israel, and Bette Midler. I was nearly thirty before I met a religious Jew." 3. "GOD made my life complete when I placed all the pieces before him. When I got my act together, he gave me a fresh start. 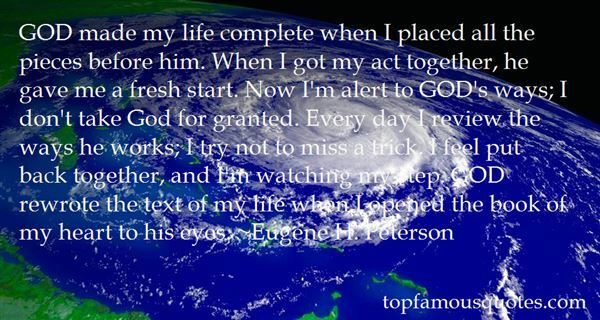 Now I'm alert to GOD's ways; I don't take God for granted. Every day I review the ways he works; I try not to miss a trick. I feel put back together, and I'm watching my step. GOD rewrote the text of my life when I opened the book of my heart to his eyes." 4. 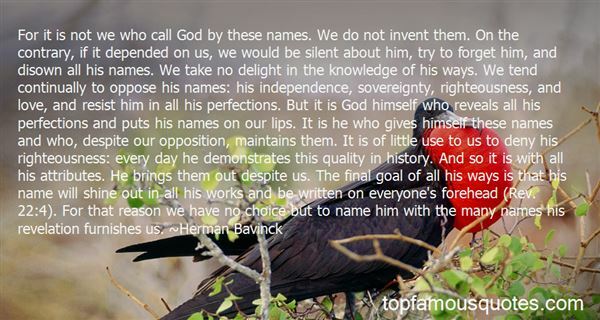 "For it is not we who call God by these names. We do not invent them. On the contrary, if it depended on us, we would be silent about him, try to forget him, and disown all his names. We take no delight in the knowledge of his ways. We tend continually to oppose his names: his independence, sovereignty, righteousness, and love, and resist him in all his perfections. But it is God himself who reveals all his perfections and puts his names on our lips. It is he who gives himself these names and who, despite our opposition, maintains them. It is of little use to us to deny his righteousness: every day he demonstrates this quality in history. And so it is with all his attributes. He brings them out despite us. The final goal of all his ways is that his name will shine out in all his works and be written on everyone's forehead (Rev. 22:4). For that reason we have no choice but to name him with the many names his revelation furnishes us." 5. "Isn't that the way God works? She'd thought. He takes the things in our lives that are ugly, disgusting, and downright wicked, and transforms them into something magnificent." 6. "Within the biblical worldview (which has not so much been disproved as ignored in much modern thought), heaven and earth overlap, and do so at certain specific times and places, Jesus and the Spirit being the key markers. In the same way, at certain places and moments God's future and God's past (that is, events like Jesus's death and resurrection) arrive in the present--rather as though you were to sit down to a meal and discover your great-great-grandparents, and also your great-great-grandchildren, turning up to join you. That's how God's time works."